Wildebeest Diaries – Buy a van. Build it out. Go places. Buy a van. Build it out. Go places. With the gas tank finally hung under the driver side chassis, and the fill point fitted to the column behind the drivers door, the next job was to connect everything up. We originally bought a filter that is supposed to go between the gas tank and the regulator. It screws directly to the tank ‘out’ valve in the air box on the LPG tank. The idea is that it catches oil/ water vapour/ crud in the tank? (Gasit were extremely vague about this) and when I finally called them because I couldn’t actually fit this filter to the tank because of the exit points from the air box are so tight around it that I wouldn’t be able to tighten the joints, plus there was no way of supporting it and it’s quite heavy so would jiggle around a LOT he implied that it was a bit unnecessary anyway so I sent it back. Connecting the fill point to the tank was straight forwards. This is a steel braid coated pigtail with female ends. 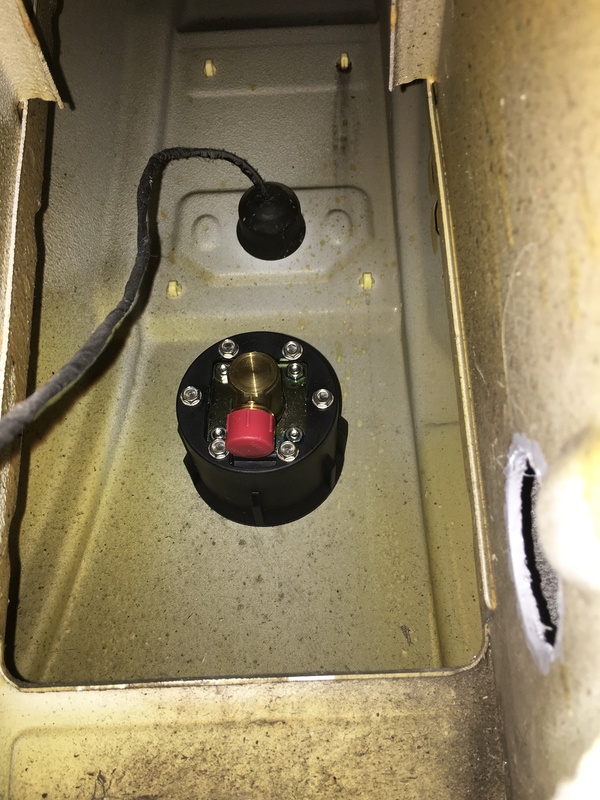 The tank outlet is connected to the regulator which is bolted to the bottom of the van floor. This is also via steel braided pigtail. 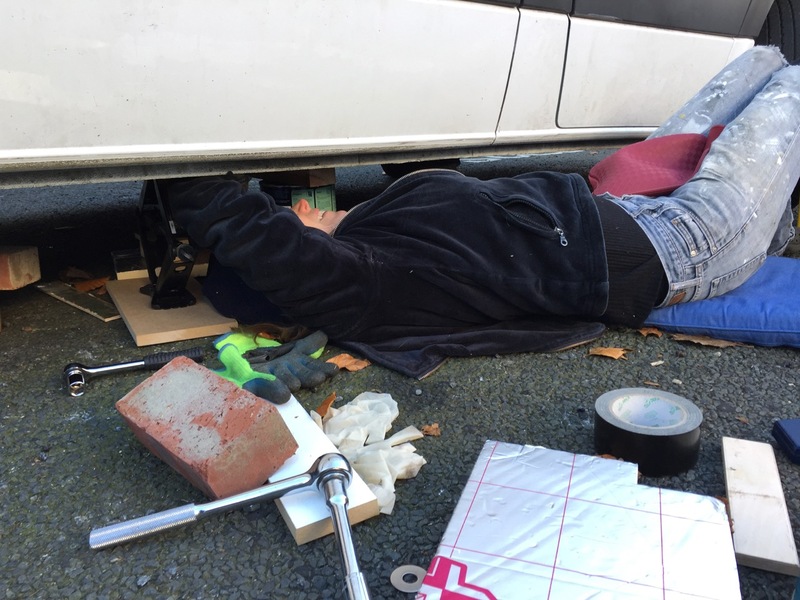 From the 8mm compression fitting of the regulator, a PVC coated copper pipe (8mm) is run through a hole in the floor to a manifold which is supposed to be in an accessible place inside the van. Each appliance can be isolated here if there are any problems. We got a 3-way manifold (about £22 from Rainbow conversions) in case we get a water heater in the future. For now the third outlet is blanked off. There also needs to be a drop-out valve (gas is heavier than air so it sinks down and out of the hole in the floor) in case of a leak. We put one in the cupboard where the heater and hob are, and another where the manifold is. The hole I drilled for the drop out valves wasn’t quite big enough and the two parts of the valve don’t fit together all the way through the floor so it sticks out at the bottom. I sealed around these holes and the hole for the copper pipe with silicone. This is from Dometic. It has 2 burners and a glass lid. We have now used this for a couple of months. The big burner is enough to get a 24cm frying pan really hot. The small burner turns low enough for a gentle simmer. The pot supports are sturdy, and can be removed for cleaning (although one little rubber bungs that holds the feet of the pot support in has already come out and so doesn’t support the pot stand fully. And would leak if there was an over boiling pot). It was relatively easy to fit although it didn’t come with a template for cutting the hole in the work surface. When the lid is down, it provides extra worktop space. The glass lid feels horrible and is noisy- I would like to replace it with a nicer material. It is really fiddly to clean and the knobs are tucked away in a dip which collects crud and grease. This is the 2000 HS model with 1 outlet for heated air. It comes with a handy template because you have to drill holes in the floor of the van. One hole for the air inlet to the combustion chamber and another for the flue for the combustion products. This means that unlike a lot of gas heaters (or using your gas hob to heat the van), the water produced by burning the gas ends up outside so reducing condensation. The heater itself is also screwed to the floor. Here is a picture of our heater before we built the cupboard around it. It also needs a power source and then the thermostat and control knob are connected via a fairly long cable so you have a bit of flexibility where you can mount the thermostat. The position of the cupboard or floor space it is in because of the vents through the floor and where they emerge under the chassis. 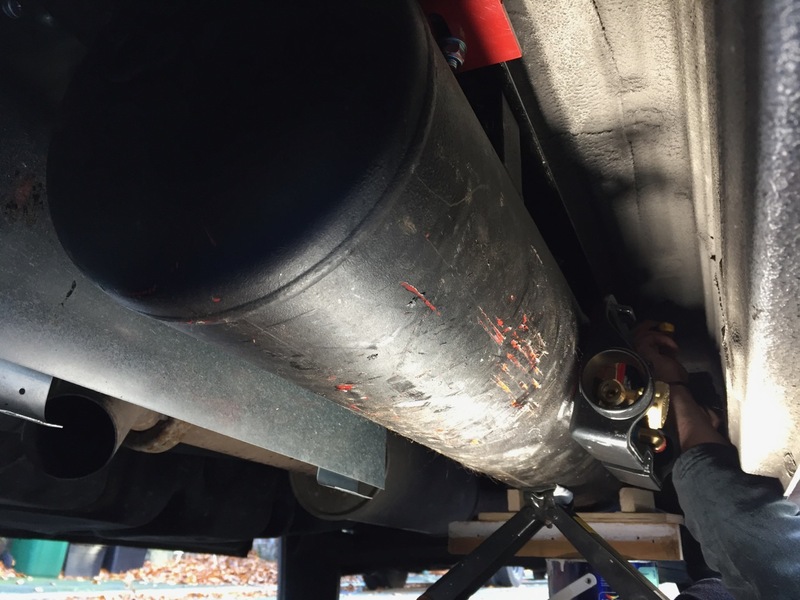 The passage of the gas pipe (8mm) from the manifold. Lastly, the air intake via vents in the cupboard must be accessible and not easily blocked by furniture or clothing etc and the same goes for the air outlet vents. In our case we had practically no space for the cardboard tube before it reached the vent so it is only about 10cm long. We’ve used it for a couple of trips now, and while I would not be without a heater, there are a few things we don’t like about this one. It seems to be reliable (so far we’ve used it for a couple of months). It seems to be sturdy and well made. 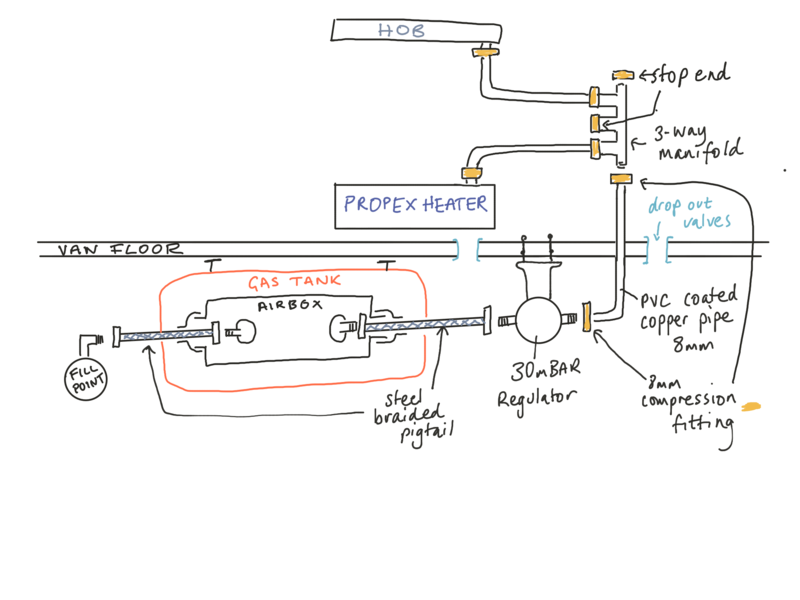 The Propex engineers are extremely helpful and friendly. The fitting instructions are good and clear. The cables and tubes are reasonably generous. You can direct where the hot air goes by swivelling the vent. It is pretty noisy – much louder than we expected – like a domestic fan heater or a bathroom extractor, but it’s in a much smaller space. The fan runs for about 20 seconds before the heater kicks in and for a minute or so after it has switched off. The thermostat seems somewhat insensitive. We have only heated the van up once enough to trigger the thermostat to switch off, and because its so loud we would rather control when it kicks in ourselves, so generally it is switched off until we need it. The thermostat is a big ugly plastic box with horrible ugly knobs. So this post was drafted as we nearly came to the end of fitting the gas tank and bits and pieces. We were waiting on an inspection by a gas safe engineer who pressure tested the system with a small amount of gas before we filled it with gas. Of course there was always the possibility that he would take one peek at the set up and condemn it before we even got to the test. As it was, he made a few small changes and also discovered that the whole set up was somewhat leaky and the engineer pretty much redid all the joints. He also pointed out that for about the same price as we had paid for everything in the end, they could have installed an almost identical setup and saved us all the pain. (For the record, that is the Propex engineers in Southampton). 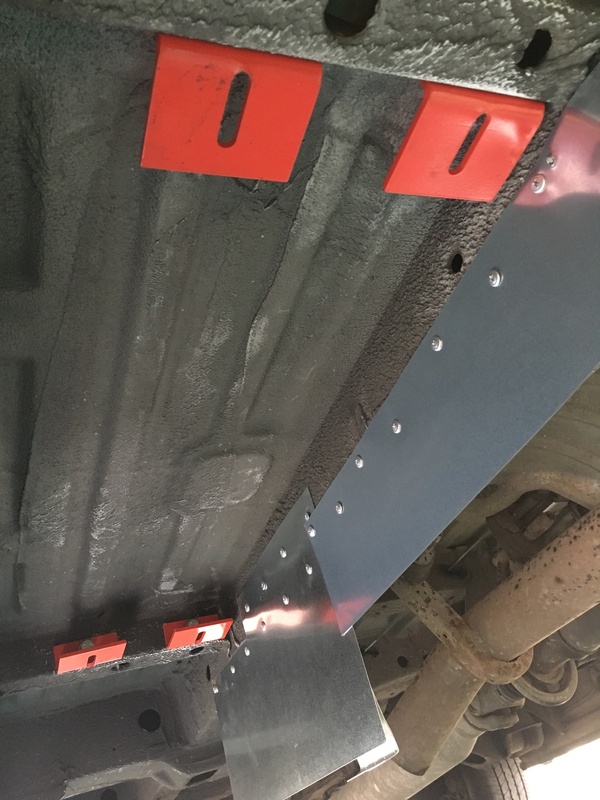 Part 1 finished with us waiting for some special brackets to be made because our Sprinter is apparently unusual in that it is missing an essential bit of steel that the gas tank should have bolted on to. We had an 81cm gap instead of a 55cm gap. Then we used the original brackets from Gasit and bolted these to the outriggers under the van. Brackets from Gasit bolted to the outriggers as per their suggestion. As you can see, we had another worry. This time that the exhaust would be venting onto the tank and it’s fittings, and the heat would make us into an IED. 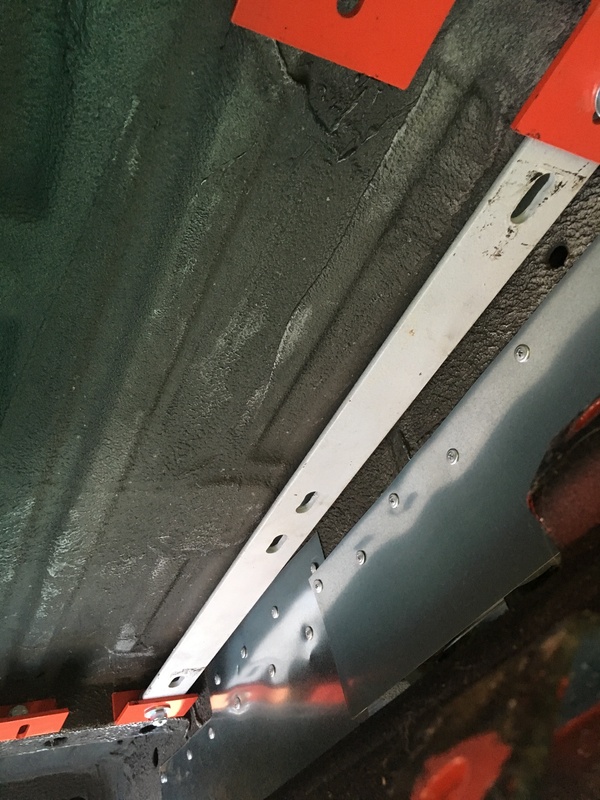 So we tried to fashion a heat shield from sheets of galvanised steel that we got from Wickes ( actually sold as protective door plates I think) which we screwed directly to the main chassis beam that runs the length of the van. You can also see that the underbody seal stuff just rubs off the tank. It stayed pretty sticky for about 2 weeks after spraying it on which made the whole job even more unpleasant. It’s like tar. Once the tank was secured we drilled the hole for the fill point in the pillar behind the driver door. This is hollow and has a handy rubbery bung underneath to allow access into the pillar. 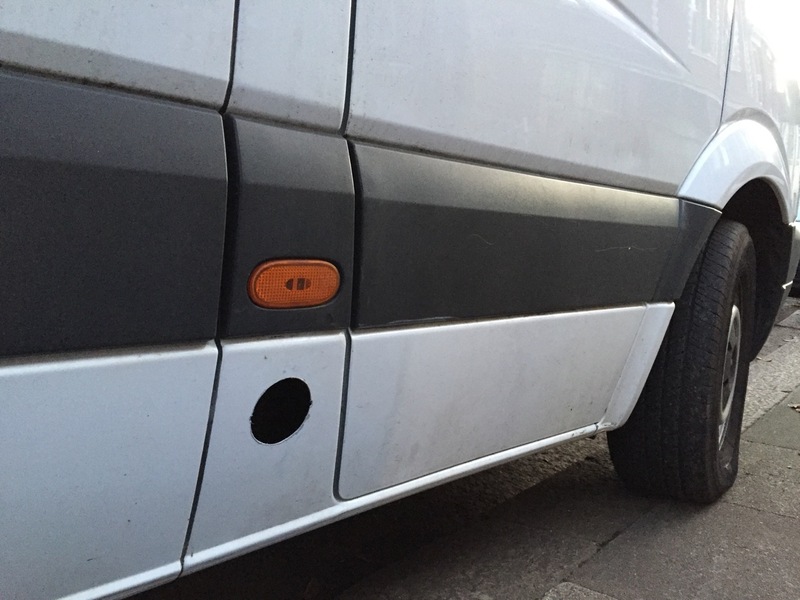 Hole drilled for the fill point behind the drivers door. I had ordered an angled fill point, but a straight one probably would have been better. View looking up into the hollow pillar at the fitted fillpoint. We fitted a 75cm angled fill hose to this fillpoint and fed it through a hole drilled through the side of the pillar which you can just see in this picture. I was worried that the hose would chafe so glued in a bit a plastic drainpipe to this hole to guide the fill pipe round the corner. 75cm was only just long enough. A longer fill pipe would have been better here, but this bit was a breeze compared to fitting the tank. As it turns out, You are not supposed to fit these things in this orientation. The gas safe man ended up turning it around 90 degrees so that the cap ends up horizontal. Part 3 will detail fitting the regulator and propex heater. Could there be a duller bit of kit in the van? Possibly so, but this one certainly scores badly on the dullness to price ratio. It simply plugs into mains power – either an extension cable run from the house, or a campsite hookup cable, and then charges the leisure batteries. It supports bluetooth, and has an accompanying app, so you can monitor the charge state from your phone, if you’re that way inclined. It’s made by Victron, so it’s pricey, but well-made. It’s also perhaps a little underpowered for our 220Ah battery setup (30A might be generally recommended), but speed of charging is not really a high priority for us, and that’s the only drawback. It’s also very compact compared to the sine inverter. Our overall philosophy about living in the van is that we want freedom; we want to be able to spend time in wild or remote places; we don’t want to be limited to visiting tourist destinations or places that cater to motorhomes and caravans. So we have big solar panels for electricity, and a large refillable LPG tank for cooking and heating. That being said, sometimes you need to make use of the facilities – for a hot shower, a tumble dryer, or to top up the batteries with shore power. For those occasions, we bought this campsite hookup cable. It has a large standard weatherproof hookup plug at one end, 20m or thick orange cable, and a circuit breaker and 3 UK power sockets at the other end. We can plug this into the campsite hookup, run the cable into the van, and then plug AC devices straight into this supply as well as plugging in the battery charger to fill up our batteries. 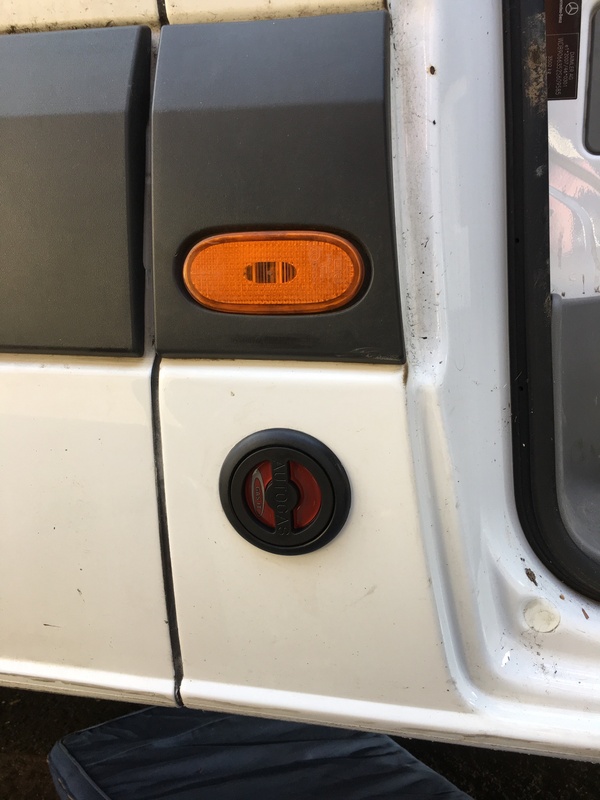 A more elegant solution would be to fit a hookup socket on the outside of the van, and hardware a 230V AC circuit with breakers and sockets. But that’s a lot of kit to buy and install, and so far this has been a good solution for the few times we resort to staying in campsites. 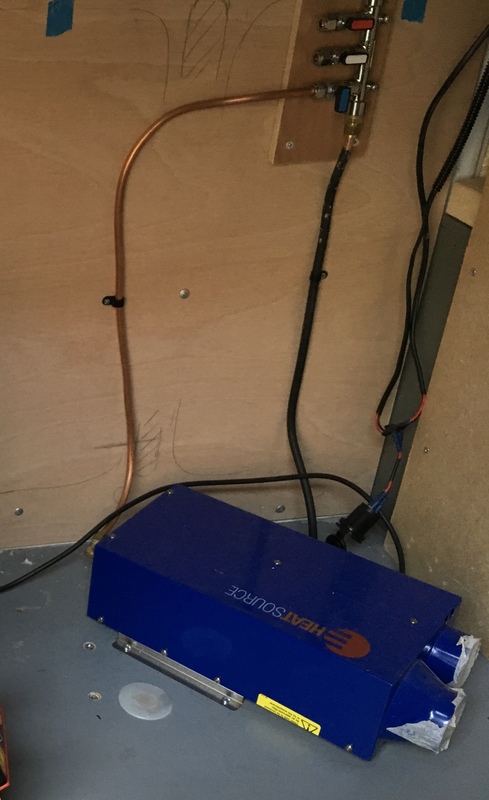 Almost everything in the van runs off 12V DC power, or can be plugged into a 5V USB port, which itself is connected to the 12V DC supply. However, some things need mains AC power. Some of those things will for the foreseeable future (a domestic vacuum cleaner, a charger for the cordless drill batteries, etc.). Some are heading towards a low-voltage DC future (small battery chargers, electric toothbrushes, laptops) but the ones we actually have still need 230V AC. For us, the main culprit is my laptop, which is not sufficiently modern to have a USB-C power port. These inverters take 12V DC, ‘invert’ it to 230V AC, and provide (in this case 2) 3-pin sockets into which you can plug your appliances. In the case of the laptop of course, this has a transformer inside the power supply, which takes the power back to about 20V DC. So the whole chain is inefficient (there is a fan on the inverter to dissipate all the wasted heat, though ours hasn’t got that warm yet) , graceless, and involves trailing wires all over the shop. But it will do the job until the future arrives. This inverter is of the ‘pure sine’ variety, which is apparently better for some fussy devices. It’s also overkill for our current power requirements (my laptop charger is rated at 60W), but I figured this would give us some flexibility in case we need it in the future. The only tradeoff, other than price (and they’re pretty cheap really) is that it’s quite big. Otherwise known as a ‘mi-fi’, this allows us to take a 4G signal (via an external antenna) and create a wifi network inside the van. It has a pretty good battery, and charges by USB. Pretty simple to set up, and no complaints so far. £80 from Amazon (affiliate link). We have this mounted on the roof, wired up via the 2 attached cables to a Huawei 4G ‘mi-fi’ device; which sets up a wifi hotspot inside the van. The antenna, as well as being far more powerful than the one built into the mi-fi device (or our phones) is also mounted outside of the giant metal Farady cage which is the van. On a good day we seem to be able to get a good 15-20Mbps speed up and down. This antenna is pretty good, and easy to fit. My only quibble is that the cables are only 50cm long, which doesn’t give you much leeway when mounting it to the mi-fi device. We also needed to buy 2 SMA-to-TS9 adapters.